QRP is amateur radio slang for 'low transmit power'. QRP digital modes such as FT8, JT9, JT65 and WSPR are modes designed to be transmit and received across the world on low transmit powers (although not everyone uses only low power). The special design of these modes allows even weak signals to be decodable by the receiving software. Released in 2017, FT8 has shown itself to now be the most popular mode by far with JT9 and JT65 taking a backseat. 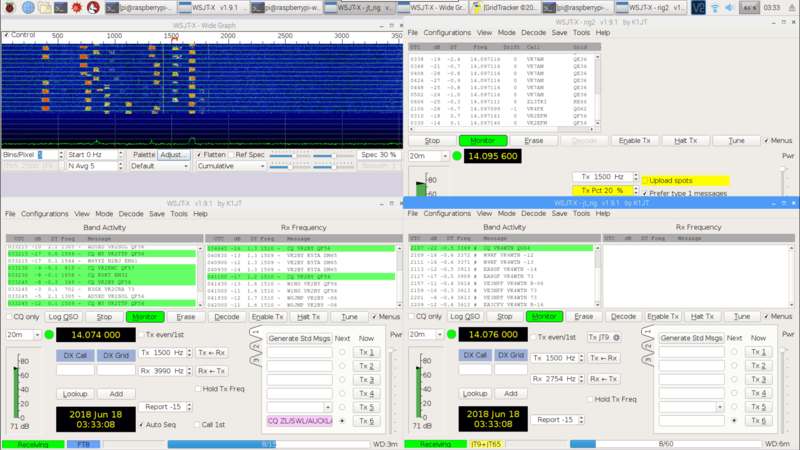 WSPR is also not as active as FT8, although WSPR is more of a beacon mode rather one used for making contacts. Apart from being used by hams to make contacts, these weak signal modes are also valuable indicators of the current HF propagation conditions. Each packet contains information on the location of the transmitter, so you can see where and how far away the packet you've received comes from. You also don't need to be a ham to set up a monitoring station. As an SWL (shortwave listener), it can be quite interesting to simply see how far away you can receive from, and how many countries in the world you can 'collect' signals from. This tutorial is inspired by dg0opk's videos and blog post on monitoring QRP with single board computers. We'll show you how to set up a super cheap QRP monitoring station using an RTL-SDR V3 and a Raspberry Pi 3. The total cost should be about US $56 ($21 for the RTL-SDR V3, and $35 for the Pi 3). So, antenna itself represents as handmade on-PCB winding made of two-side-foiled fiberglass size of 30x40 cm. Both 'windings' connected in the middle and thus winded to 'continue' each other. Preamp located in metal box attached to antenna and connected via 1.5m S/FTP cable to another box with RTL stick. Note that some transistors soldered on PCB in upside-down - dot on layout means base. Electrically preamp made as 3-stages balanced signal amplifier with low-input impedance and low-pass filter before input with cut-off at 15MHz. Such complications were required to reduce interferences and intermodulations. Antenna itself is more effective on long-medium waves, so preamp has higher gain on short waves (gain varies from 45db at 200KHz to 68 db at 10MHz - see attached freq responce pic). Getting more flat responce at lower frequencies is possible by increasing C10/C11/C12 to 22nF. My implementation has some additional elements to make possible to adjust preamp's gain in few db's. But seems its quite useless so that details not included in this post. Anyway, its possible to reduce gain by increasing R6 to 500K. Box with RTL SDR: I put both signal wires as 3 windings via ferrite ring with high permeability just before RTL chip. This noticeable reduced stray interference, that induced in that cable but doesn't affect differential signal. Over on YouTube user IW2DZX has uploaded a video showing him using an old EeePC 900 to receive HF with an RTL-SDR V3 running in direct sampling mode on a Raspberry Pi 3 which is running a SpyServer. An EeePC 900 is an old netbook that was released in 2008 which is lightweight, portable and was fairly cheap. Second hand Eeepc's can now be found on eBay for less than $60 US. By running the RTL-SDR on a Raspberry Pi 3 with SpyServer the need to have the dongle connected to the netbook is eliminated. Instead the radio data from the RTL-SDR is efficiently sent over a network connection and received via the WiFi on the Eeepc. Recently this week three new reviews of our RTL-SDR V3 came out, all reviewing its operation on HF frequencies. In the second review Gary (W4EEY) posts a review to swling.com and provides various screenshots of the dongle in action in HDSDR. Over on YouTube user crookedninja5 has uploaded a video showing what he calls the “Easy HF dongle mod”. The mod involves soldering a wire from Pin 1 on the RTL2832U chip to the static protection diode near the antenna input. At the same time he also uses the modified RTL-SDR dll file for SDR# which enables the “no hardware mod” direct sampling mode. Using this mod he is able to get decent coverage of 0 – 14.4 MHz. SDR Shortwave Radio Mod "easy HF dongle mod"